"We must defend ourselves." Another foreign film that definitely seems worth checking out, especially if you're a fan of actor Gael García Bernal. 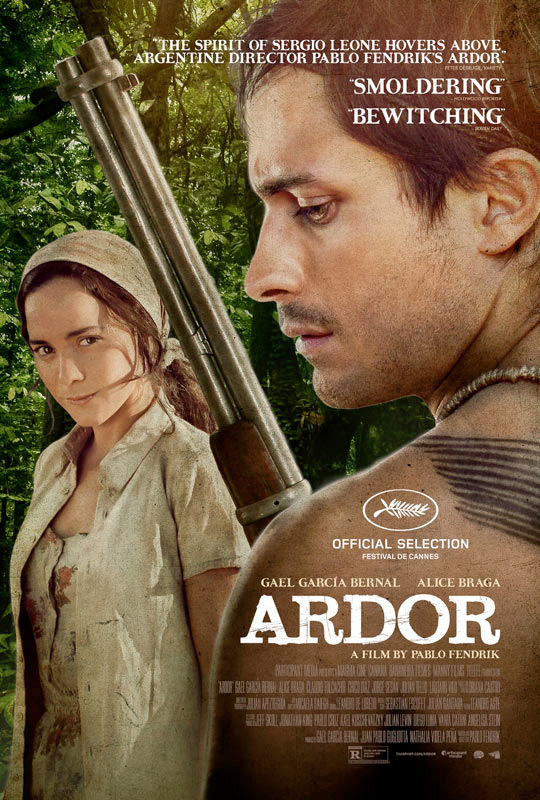 Participant Media has debuted a US trailer for the upcoming summer release of Ardor, originally El Ardor, a film starring Bernal as a mysterious man who emerges from the Argentinean rainforest to rescue the kidnapped daughter of a poor farmer after mercenaries murder her father and take over his land. The film earned mostly positive reviews at festivals last year, like this one from THR, and looks like a solid action thriller described by another critic as a "machete Western". This actually looks pretty damn good, with solid action and cinematography, I'm interested in seeing it soon. When fires sweep through the rainforest near their property along the Parana River, a poor tobacco-farming family goes on high alert. The head of the family, João (Chico Díaz), correctly suspects the fire is a result of slash-and-burn tactics by ruthless land-grabbers intent on acquiring the farm he shares with his lovely daughter, Vânia (Alice Braga), and her partner, Jara (Lautaro Vilo). Help arrives in the form of Kaí (Gael García Bernal), an enigmatic man bearing indigenous tattoos who comes out of the jungle with the grace of a jaguar. El Ardor first premiered at the 2014 Cannes Film Festival, before going on to play at other festivals. Participant Media will be releasing Ardor in limited US theaters starting July 17th this summer. Intrigued? "Smoldering." "Bewitching." ??? I am in! I'll watch almost anything that Gael Garcia Bernal is in! The world is full of keeyunts like those land grabbers, hopefully he'll kill a lot of them before they get him. Look forward to seeing it.